I wrote this entire post and wordpress reverted back to only the first sentence despite saving often. I don’t think the original was brilliant, but my rage in the aftermath didn’t lend itself to good writing. My apologies in advance. Every once in a while I get stir crazy to use some of the awesome things I keep in my freezer. This post is about one of the meals that came out of those fits. I pulled a pound and a half of ground venison and a stick of beef marrow out of the freezer to thaw for a few days and thought about what to make. 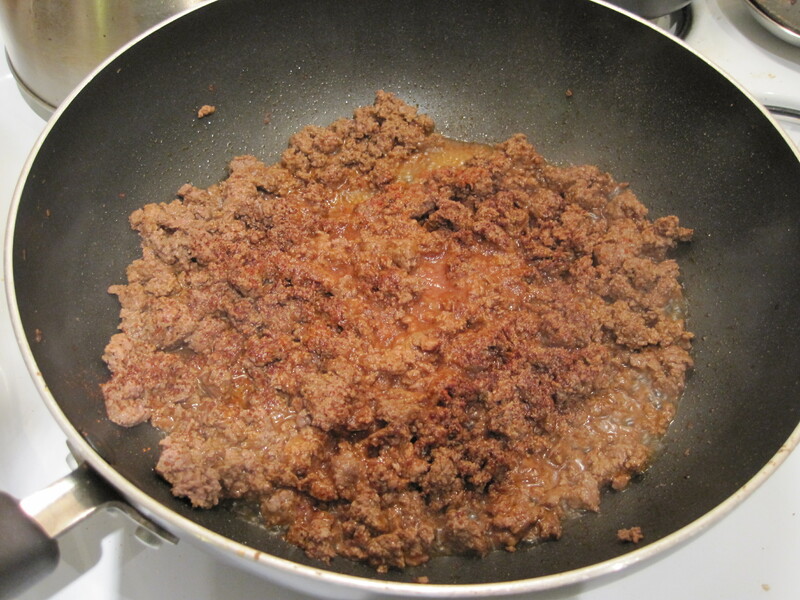 Ground venison is extremely lean which makes it dry and chewy when cooked. A variation on shepherds pie seemed like the best way to hide some of the texture issues. Before I dive into the cooking, my friend Annie is selling pies to raise money for charity through the Pie in the Sky program. It’s an awesome cause, pie is delicious, and… pie is delicious. Click here to buy yerself a pie. I started out with the ingredients that would take the longest to cook. 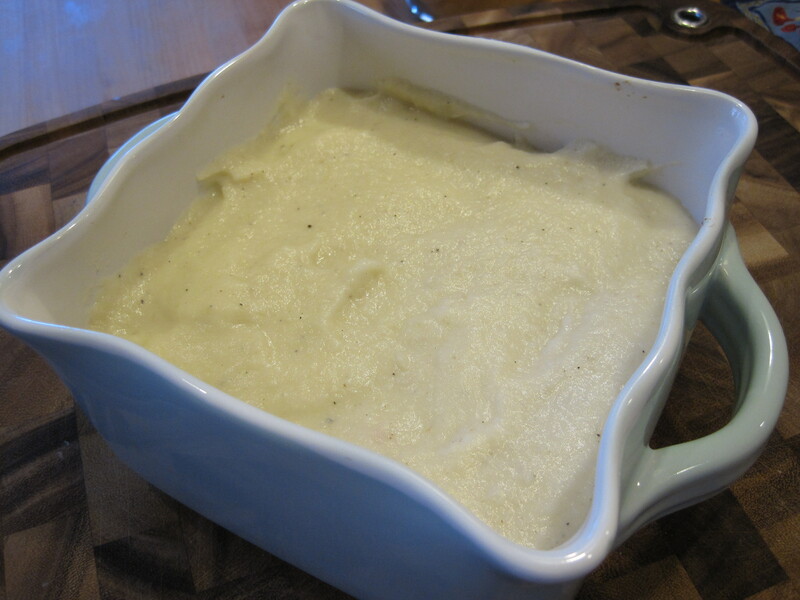 In this case, the celery root that would become the top layer of what I decided to call “hunters pie”. 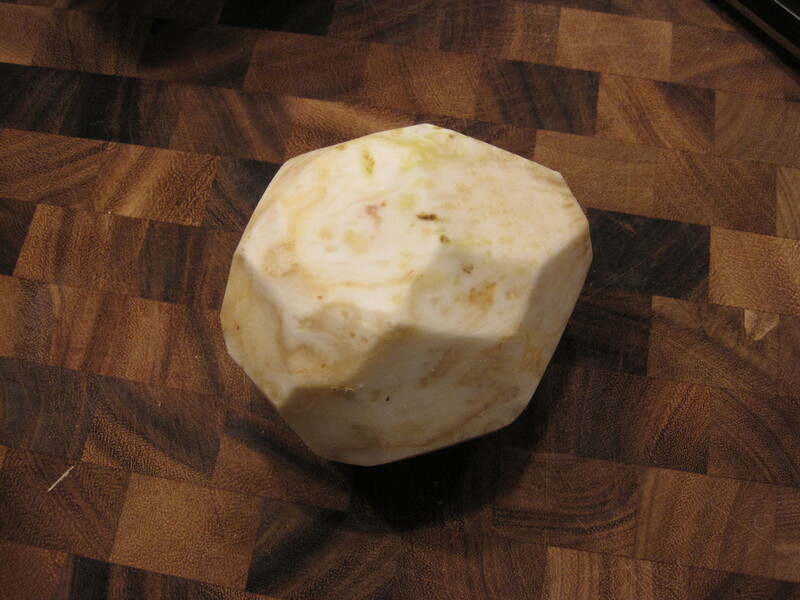 Along with a peeled yukon gold potato and a half onion, the cubed celery root went into a pot of boiling half milk/half water and salt to cook for thirty minutes. I was hoping that the celery root puree would be smoother than the traditional mashed potato layer but also thicker than the layer I added to the moussaka. While that cooked, I started working on the middle layer of the pie that would have been corn in a normal shepherds pie. With the top and bottom layers featuring strong savory flavors, I needed a solid contrasting sweetness. 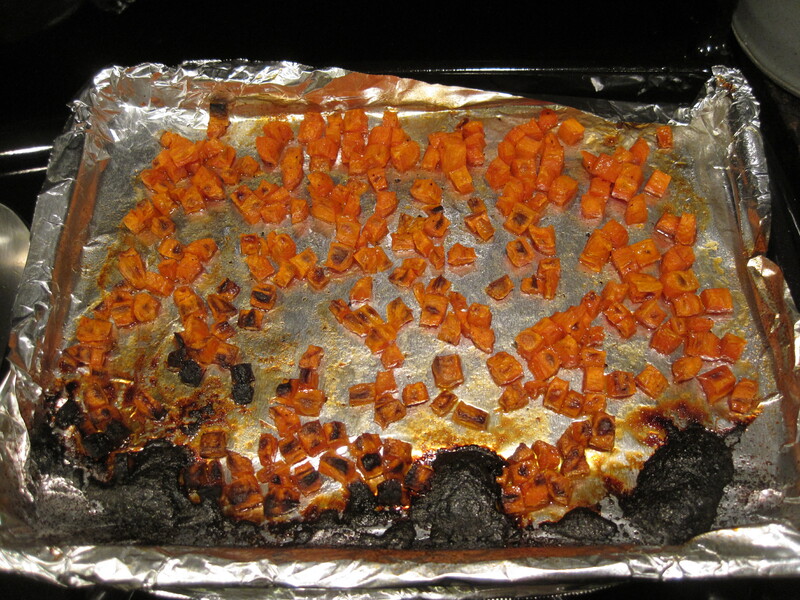 Cooked carrots seemed up to the challenge. 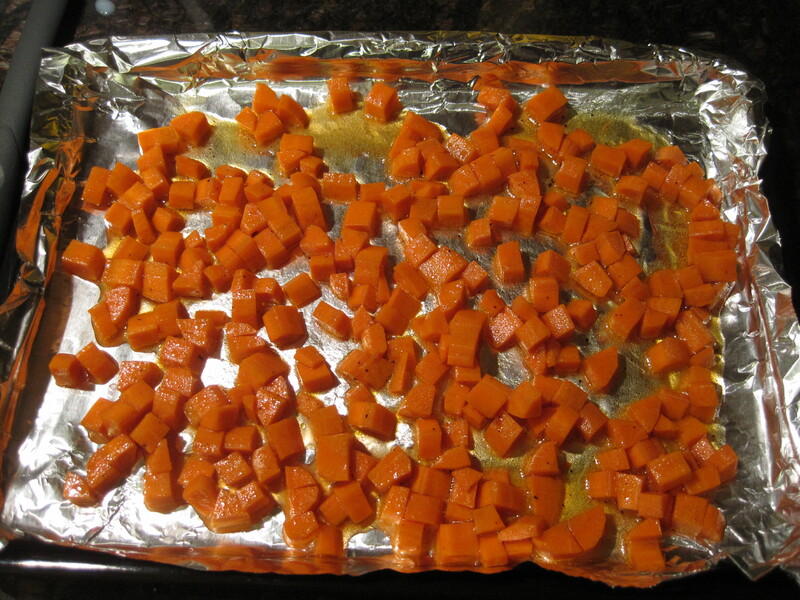 The plan was to dice the carrots small, season them with salt, pepper and equal parts maple syrup and olive oil, then oven roast over high heat. My goal was to have the carrots cook completely with a crispy outside to give an additional contrasting texture to the pie. With the carrots ready to go, I prepped the ingredients for what would eventually become the gravy. 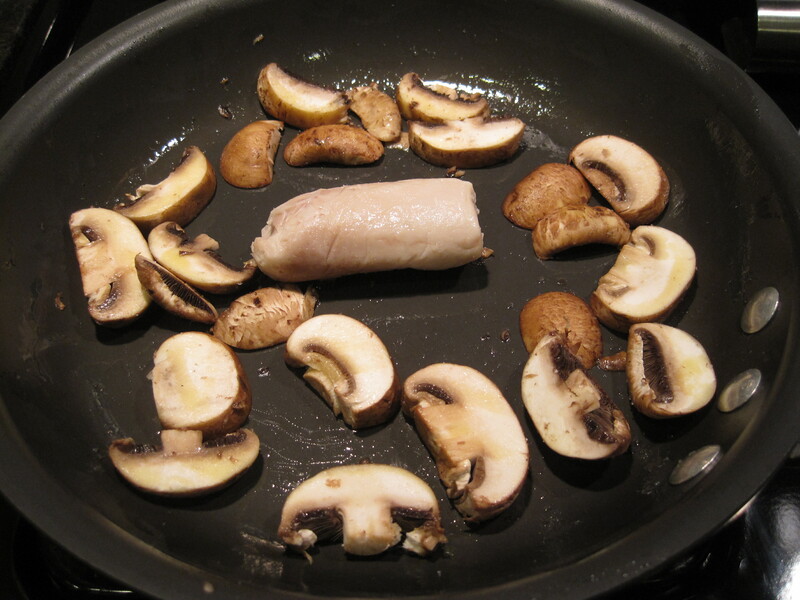 Pretty simple really, just tossed some thick sliced mushrooms with olive oil, salt and pepper and placed them in a pan with the stick of bone marrow. 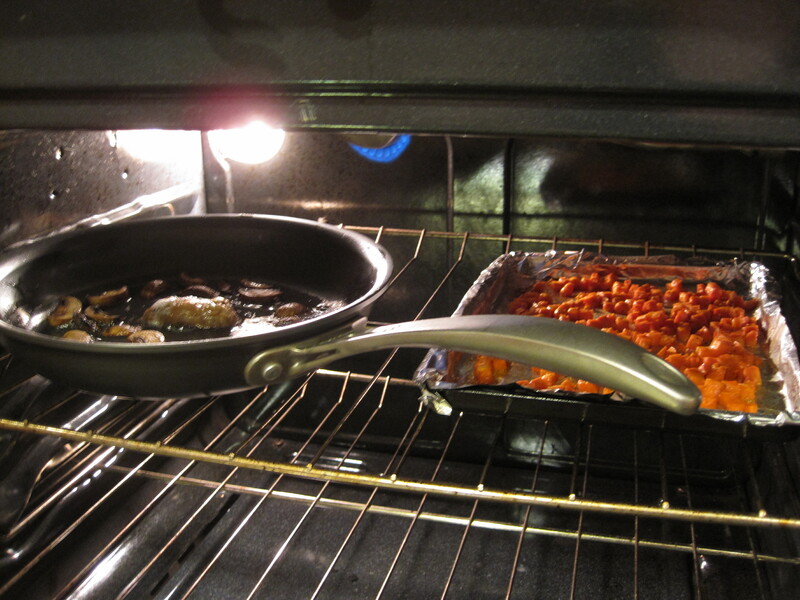 Both pans headed into a 425F oven on the top rack to cook for 20 minutes, including five minutes under the broiler to add some color. With the carrots and the gravy base almost complete, I began work on the ground venison base for the hunters pie. Sticking to all that I know about venison and how well it goes with onions, I started off with caramelizing a medium chopped yellow onion in a little bacon fat and butter. 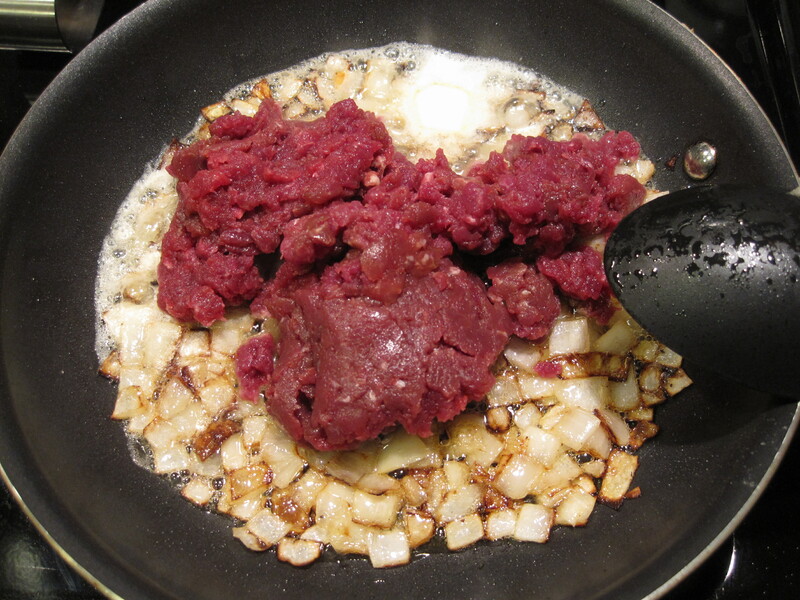 Once the onions had some nice color, I added a little more butter and 3/4 pound of the ground venison. A few minutes later, all ingredients for the pie and the gravy base were done simultaneously. With all of the layers prepped, they all headed into a casserole dish for baking. The whole dish went into a 350F oven to cook for 20 minutes together. While that was going on, I pulled the mushrooms and remaining marrow solids out of the pan and transferred them to a cutting board. The remaining fat and juices went over medium heat on the stove top with a hearty sprinkle of flour to cook for 6-8 minutes stirring regularly. 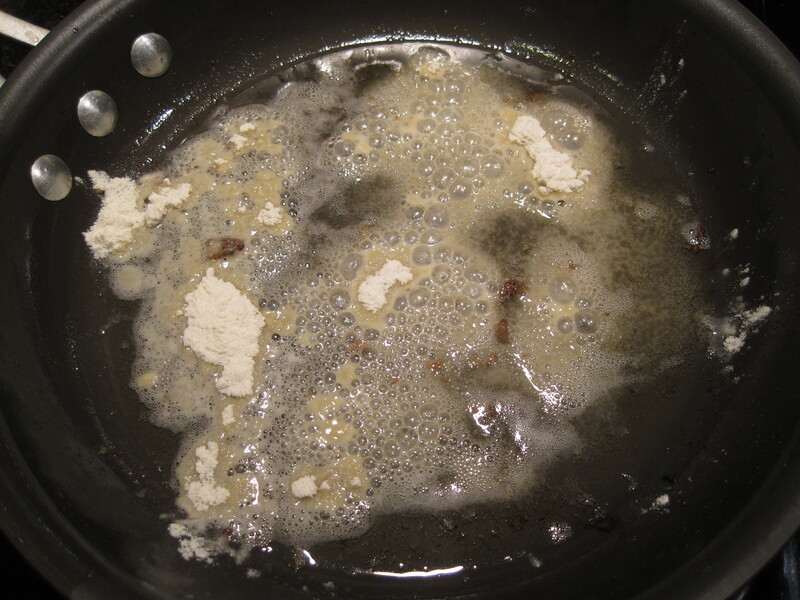 Once the color of the flour and drippings had darkened a little bit, I poured in a good splash of dry sherry, probably around a half cup, whisking constantly. 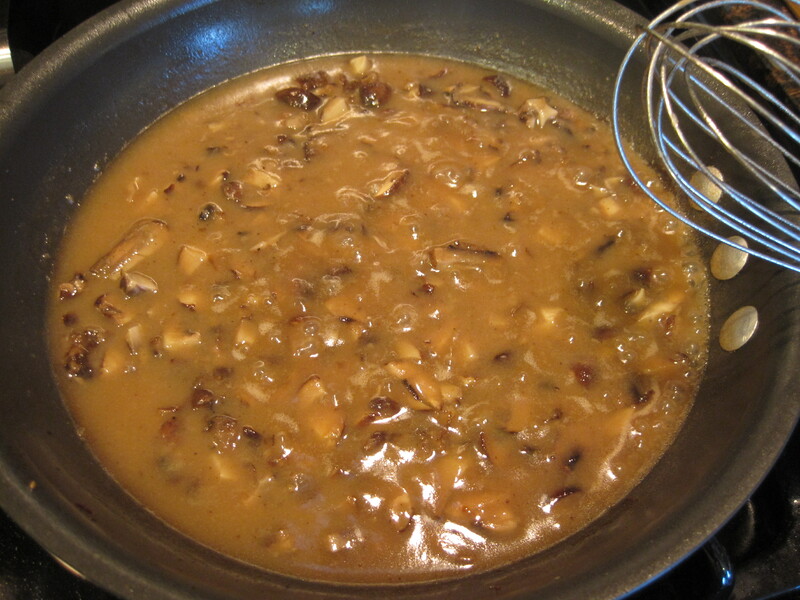 After the clumpy remaining mixture cooked for another minute or so, I whisked in an additional half cup of beef broth and added the chopped mushrooms and marrow solids back in with salt and pepper. And, sadly, with that the photos are done for this blog post. I somehow never took the time to snap a shot as I spooned out each bowl. 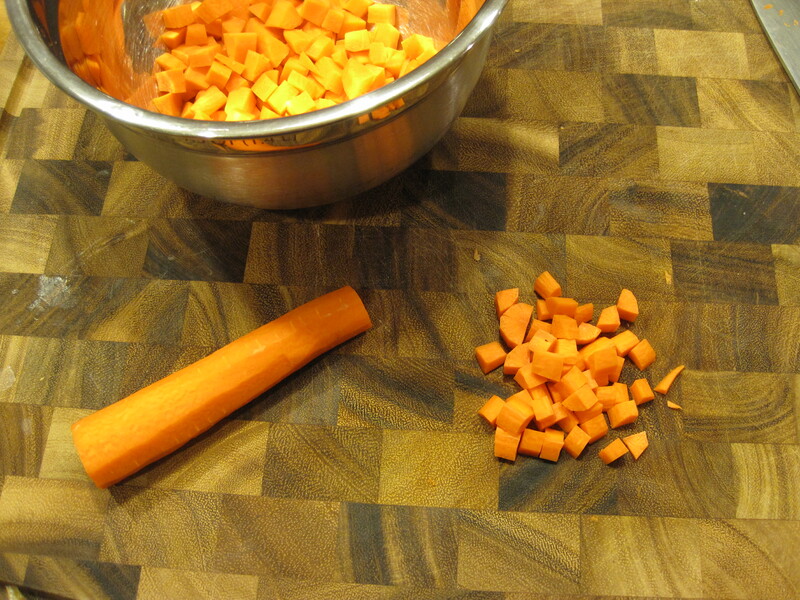 In a bowl, the components were all clearly visible, with the ribbon of bright orange carrots clearly dividing the celery root mash from the ground venison mixture. Wasn’t visually stunning or anything, just nicer looking than the white on white contrast of the last picture in the blog. The pie was one of the best things I’ve made in a long time. The ground venison had just the right amount of caramelized onions and saltiness to make sure it stood out among the other ingredients. The carrots didn’t have quite as much texture as I had hoped, but the sweetness and carrot flavor was a a great contrast to the salty layers. The celery root was like creamy mashed potatoes with a strong black pepper and celery flavor. Despite being the most balanced dish I had ever made, the true hero was the roasted bone marrow and mushroom gravy. The sherry flavor was rich, sweet, and wine-y, and the mushrooms had taken on a flavor that was close to truffles during the roasting process. A perfect topping to the dish. Thanks for reading, will share my first experience with slow roasted bolognese next week. Over the past few weeks I’ve cooked a lot of stuff I’ve never attempted before, but nothing quite elaborate enough for a full post. I’ve got a few other posts queued up for the next few weeks, but figured I’d clear out the backlog with this one first. Sooooo, you’re ending up with another edition of Cleanin’ out my Cabinets that will show some of the more interesting recent dishes. This category isn’t exactly a best seller on this blog, but oh well; you gotta take the bad with the… slightly less bad. First up is baba ghannouj. I love hummus but have definitely had some mixed experiences with baba since, while similar, the flavor and consistency seems to vary widely. The ones I’ve always enjoyed the most had a lot of tahini, garlic, and lemon flavors, particularly the variety served at Magic Carpet in Philly. With that in mind, I pierced a few holes in the side of a large eggplant and placed it in the oven to cook for 40 minutes at 375F. 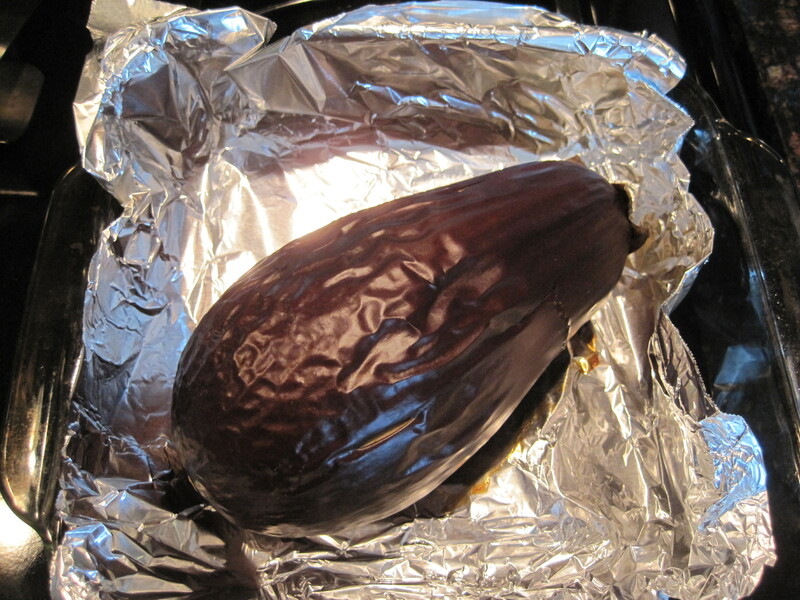 Once the eggplant had cooled enough to be handleable, it was surprisingly easy to peel. In other news, I see the little wiggly red line under “handleable”, and it certainly doesn’t look right, but I am going to stand by my belief that it is a word. 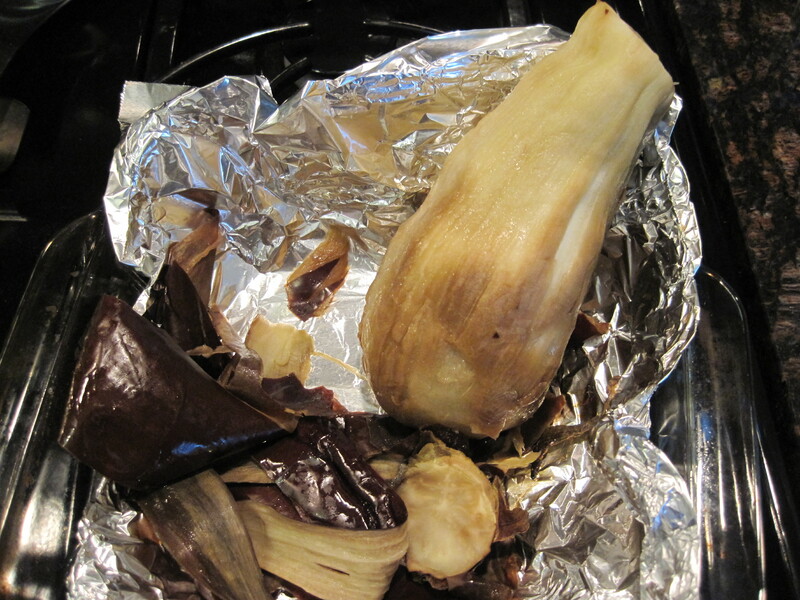 Once the eggplant was peeled I placed it on some paper towels for 10-15 minutes. Theoretically, this was supposed to drain some of the bitter juice from the eggplant but it didn’t really pull out any liquid. 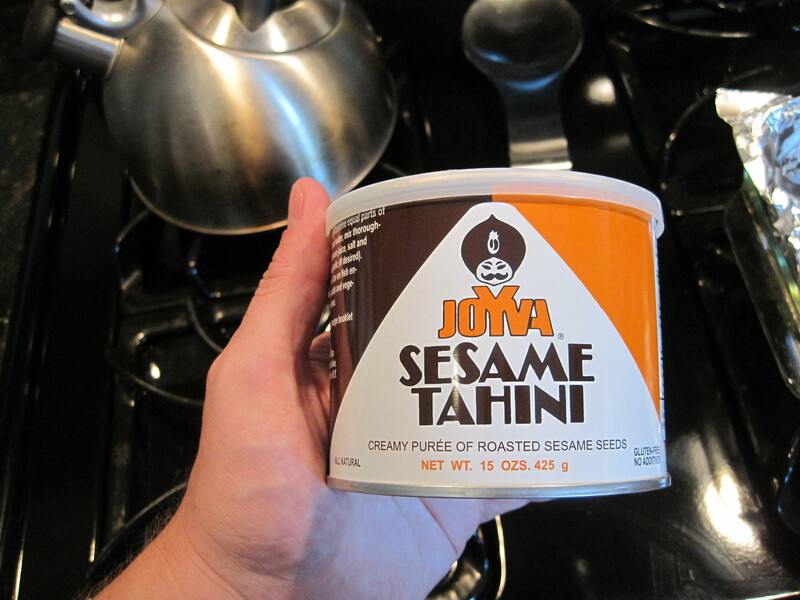 It did give me a chance to get out the can of tahini and use a can opener to open it. For anyone who hasn’t used it, its like a soupy thin peanut butter that tasted like roasted sesame. When you open the can it’s completely separated into oil and solids, like organic peanut butter, and needs to be stirred heavily. 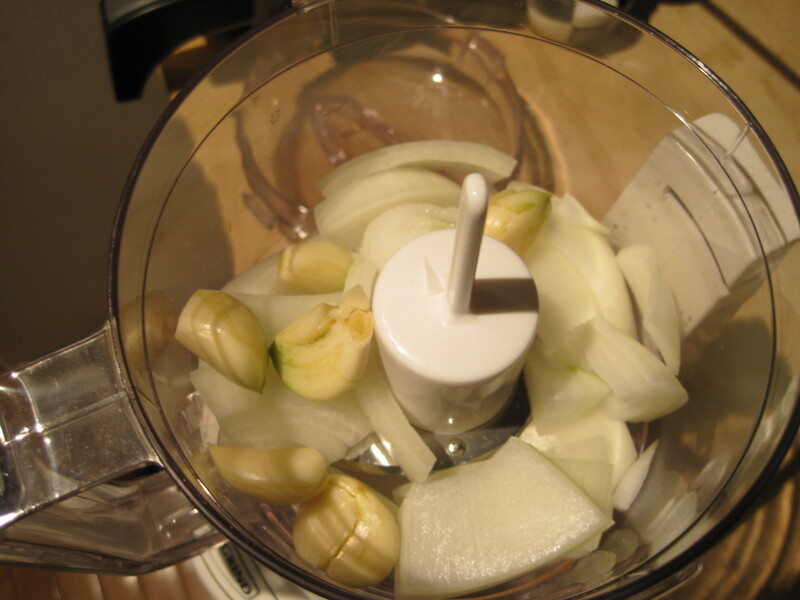 I sliced the eggplant into chunks over the blender the same way you would slice a banana over a bowl of cereal. 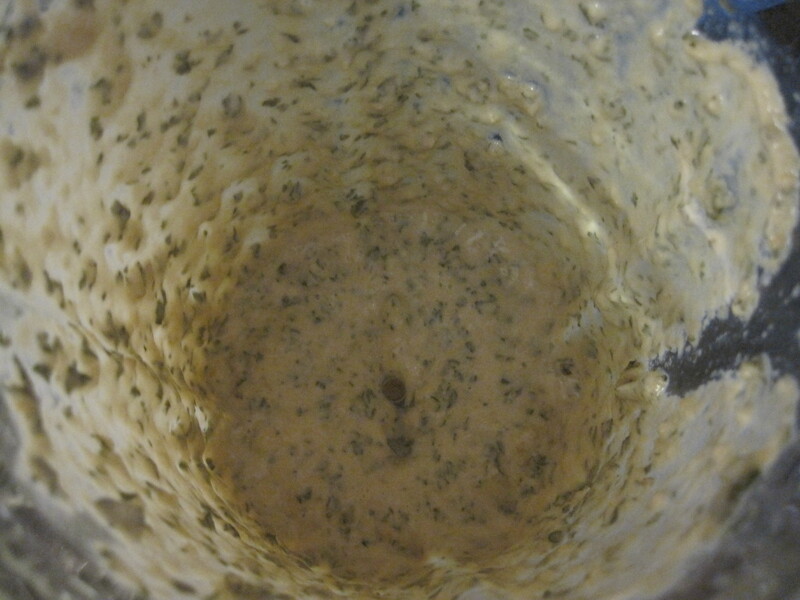 I then added two large spoonfuls of tahini, a handful of flat parsley leaves, juice from one lemon, a tablespoon of minced garlic, and lots of salt and pepper before pulsing the blender. A few more pulses and it was ready for a bowl. As I said while I was eating it, I think I just don’t like baba as much as hummus. My version could have used a little more tahini and lemon juice, and a little less garlic. It also just didn’t have as much eggplant flavor as I wanted, which is surprising to me since it went in seeds and all. Not bad, just not as good as I was hoping. Next up was some recipe writing for Pete & Gerry’s Heirloom Eggs. The company is run by a few friends from college and I recently started writing recipes for their site in exchange for free eggs. Works for me, since I love eggs and theirs are really in a different universe than the sad yellow yolked “sweatshop eggs” (as Kramer put it) you get in the cardboard cartons. It’s also fun to have the challenge of making dishes that highlight an egg and aren’t just breakfast. 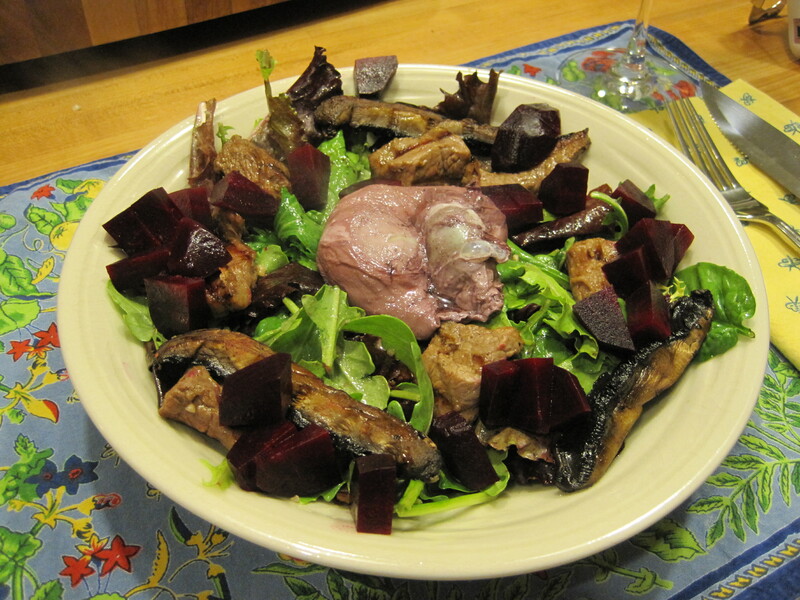 Anyhoo, when the temperature dipped last week, it seemed like a perfect time to make a hearty fall salad with steak tips, beets, mushrooms, and red wine vinaigrette. 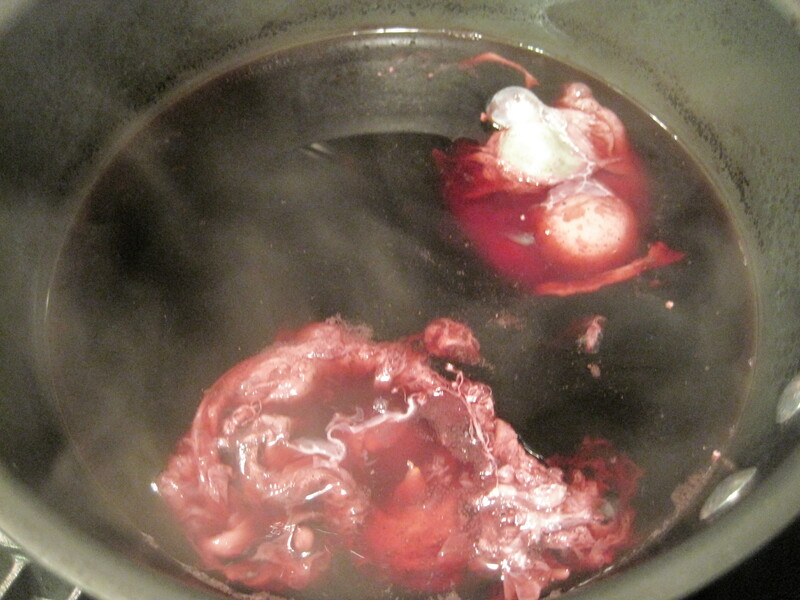 I thought the addition of an egg poached in red wine would make the flavor richer and the dish much nicer to look at. First step is dumping your finest bottle of Three Buck Chuck into a pot with a little chicken stock and bringing it to a boil. 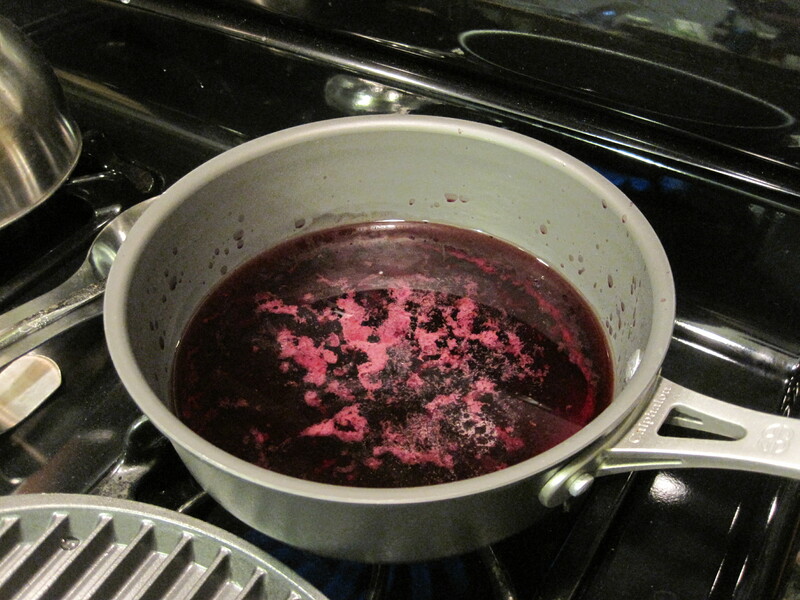 While the wine rose to a boil, I heated a grill pan and mixed together some red wine vinegar, olive oil, honey, and garlic for the salad dressing (details are here). 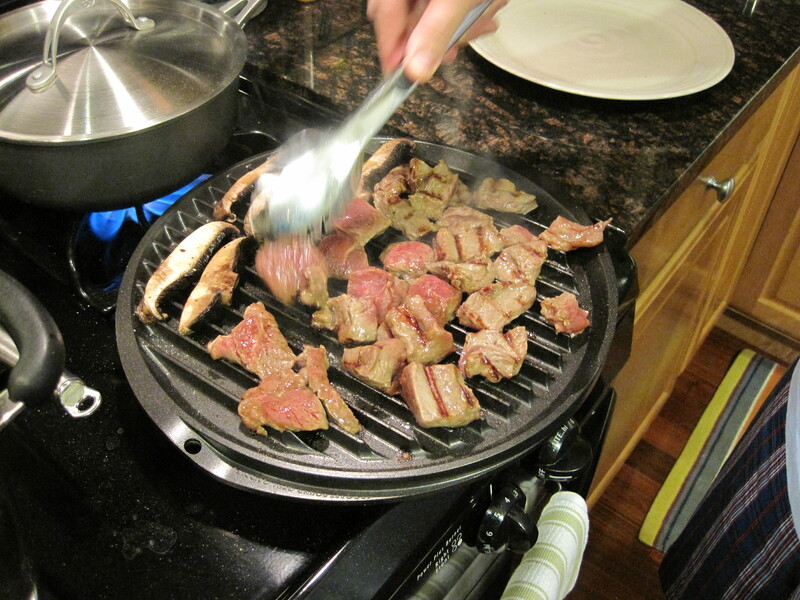 Once the grill pan was hot, I put the meat and mushrooms on with plenty of salt and pepper. 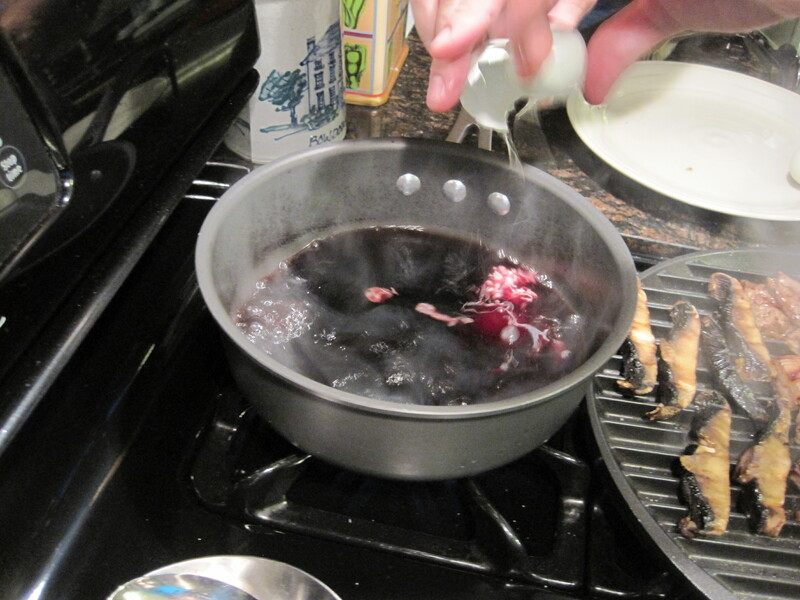 Once the wine was at rolling boil, I dropped in two eggs over the areas that were bubbling the most. Which worked perfectly as a centerpiece to the plated salads. The best part was breaking into the yolk before mixing the salad up a bit to distribute the bits of egg and the rich yolk. This was a really delicious dinner. 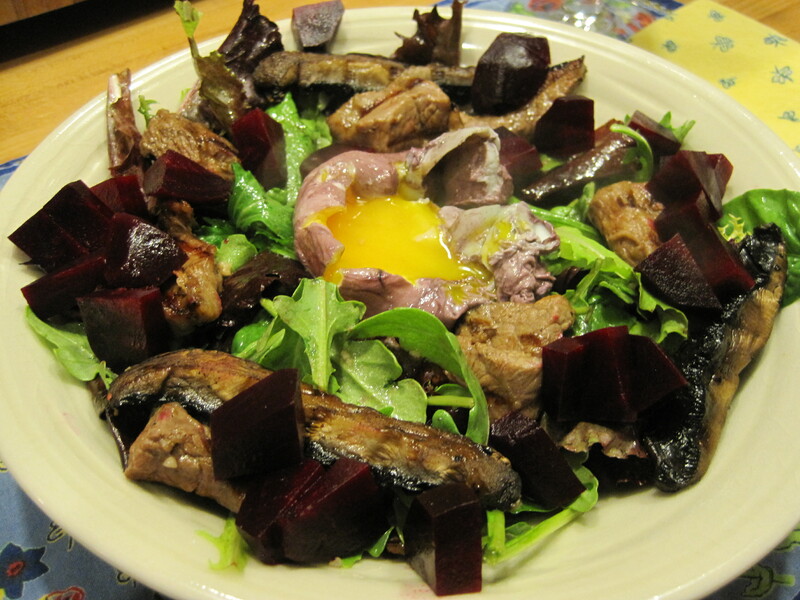 The red wine poaching mixed well with the vinaigrette and the rich yolk helped make the salad a lot more filling than your average salad. I can honestly say I was stuffed after eating this, which I have never said about a salad before aside from those pseudo salads that come in the awesome fried taco bowl and are essentially a giant nacho. Last up was a hearty venison dinner we had a few nights ago. I haven’t cooked venison since last fall for a two reasons: it’s more of a cold weather meal and the last time I cooked it Kristi was two months pregnant, very nauseous, and made me wait until she went to sleep to eat it. She’s had almost no interest in venison since then, but OK’d a trial run this week. 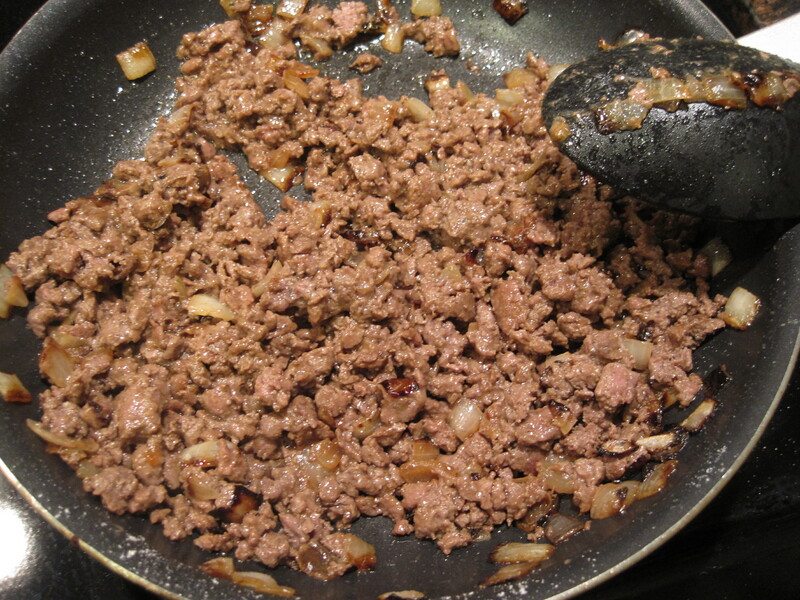 The traditional way Kristi’s family cooks venison is in a pan with butter and onions. Pretty much can’t go wrong with that, since the butter and onions go great with venison. I wanted to switch it up a little, so I went with a grill pan over high heat. To add the other two key flavors, I caramelized a chopped onion and poured a melted tablespoon of butter over the meat along with salt and pepper. From there, the meat went onto a hot grill pan for a couple minutes on each side. 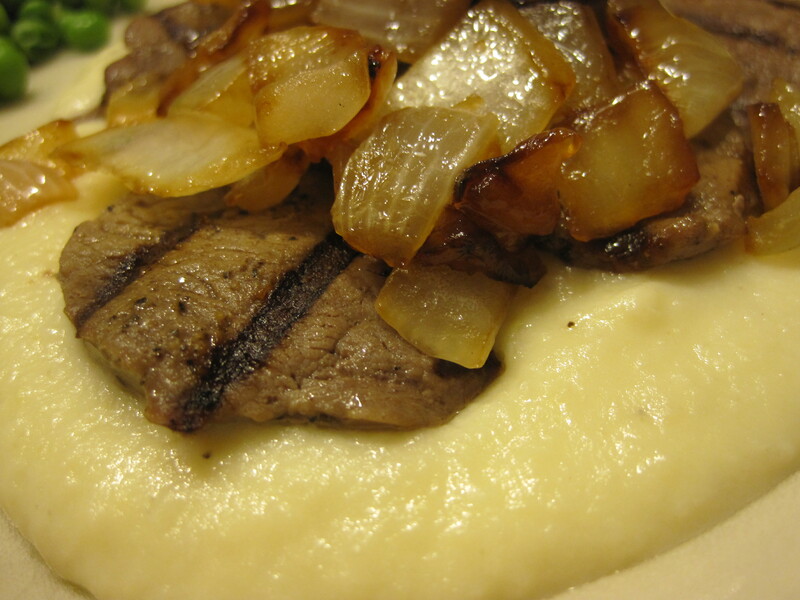 Once the meat came off, the medallions went onto a celery root puree and were topped with a spoonful of the onions. Once again, Kristi was going nutso with detail shots of the meal. Another great, filling meal. 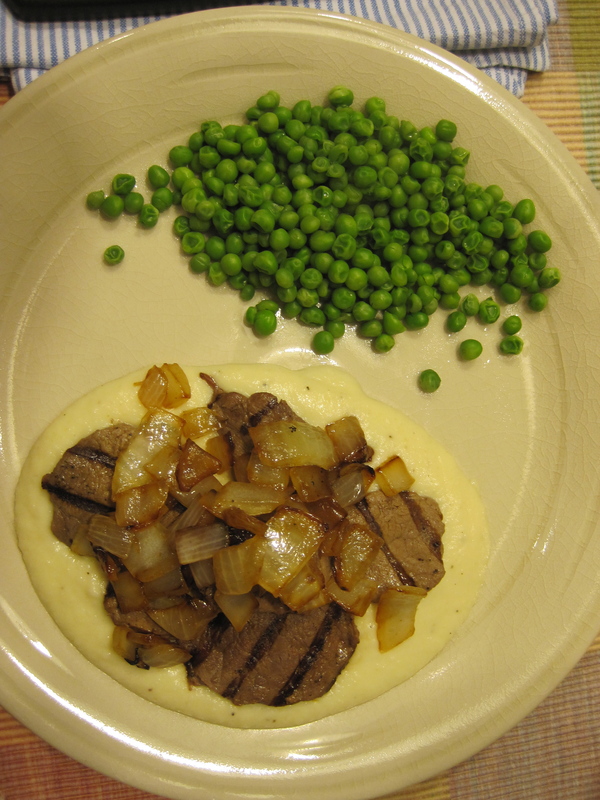 The puree almost made it too rich, but combining everything on the plate including the peas was awesome. Big thanks to Kristi’s uncle Billy for the venison which he gave to us along with some homemade venison sausage. Billy (and that sausage) will be discussed more in a future post. I’m thinking the next post should be a WCIC, so it might be time to finally bite the bullet and buy that ox kidney I’ve had my eye on. Something to look forward to. 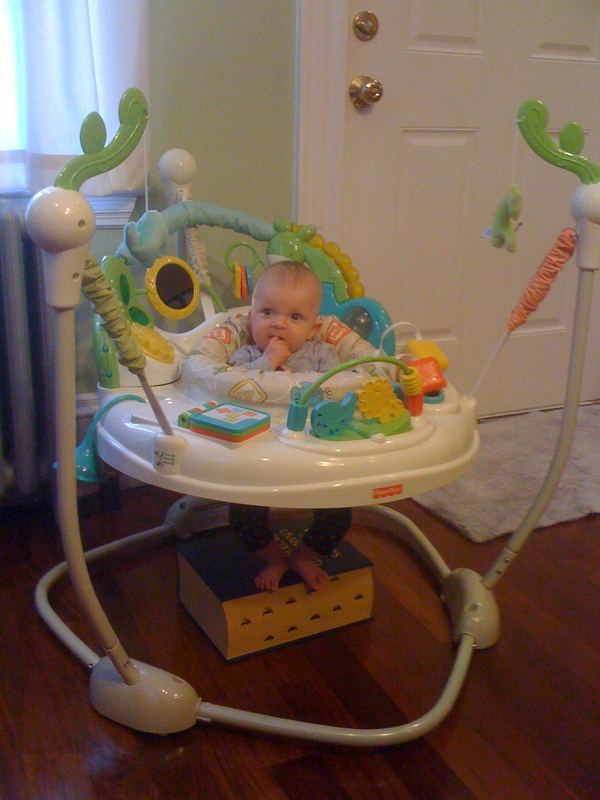 Unless you happen to be hanging out in a bouncy seat in the kitchen watching my every move. I have a feeling Janet's first words will be "no thank you"
Couldn’t put a “Weird Crap I Cook” title on this one. It came out too delicious. Part of the load of venison we received was a few pounds of ground venison. I wanted to make some unorthodox tacos and involve some new flavors that I thought would bring out the flavor of the meat. I also felt like nearly burning out the motor on my Cuisinart mini-prep and driving Kristi insane with it’s high-pitched scream. 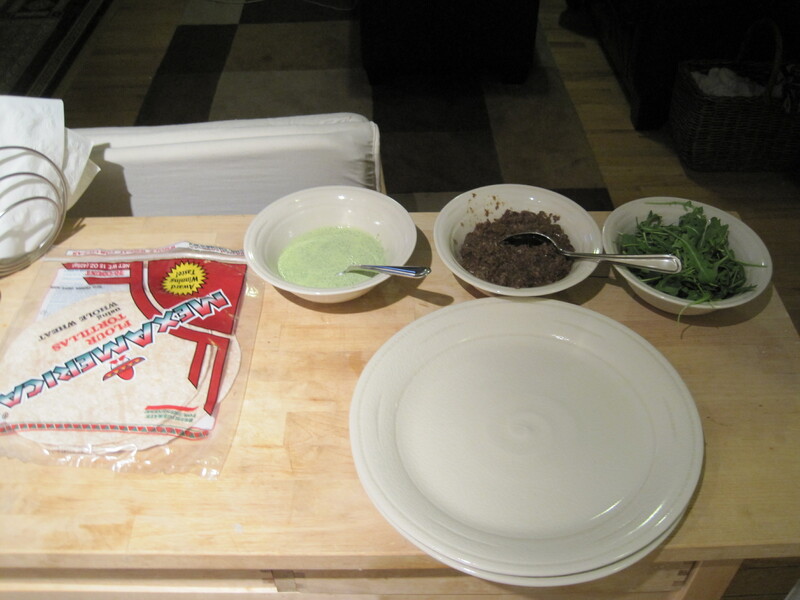 First item prepared was a mushroom paste that I planned on smearing on the tortillas prior to loading them with meat and the other toppings. 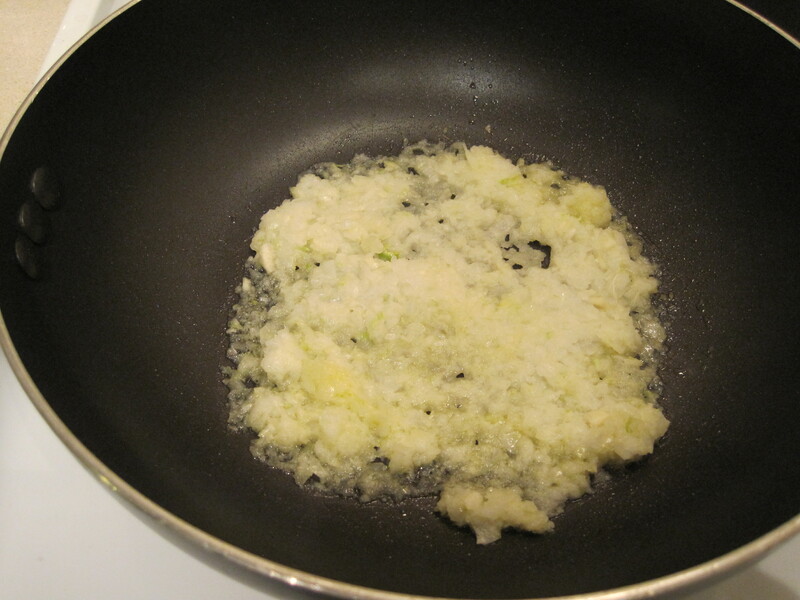 For flavor, the paste started with garlic and onions. Once chopped, these went into a pan with some olive oil. 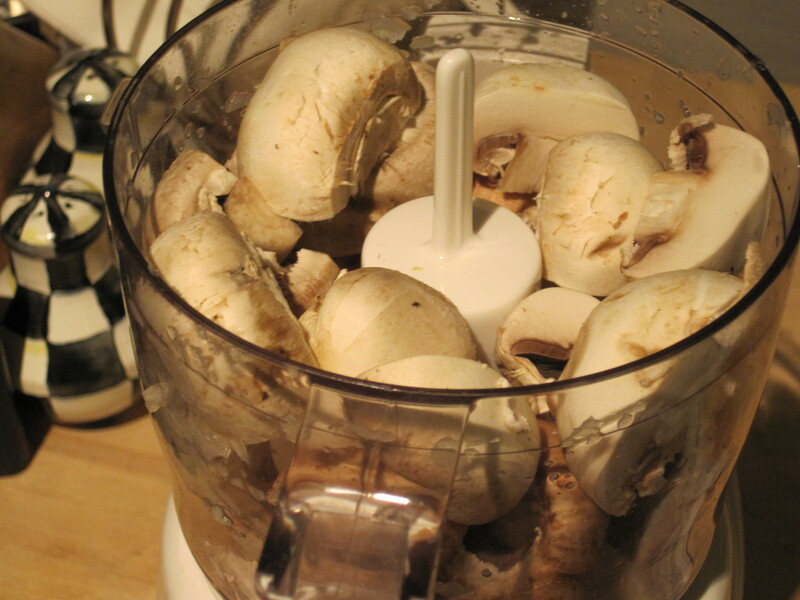 While those sauteed for a few minutes, I mini-prepped about a pound of white and brown mushrooms. When they are ground up in a Cusinart, you recognize how little substance there is to mushrooms. A pound of them were reduced in size to a couple large spoonfuls that went into the pan with the onions, garlic, and a little marsala wine. 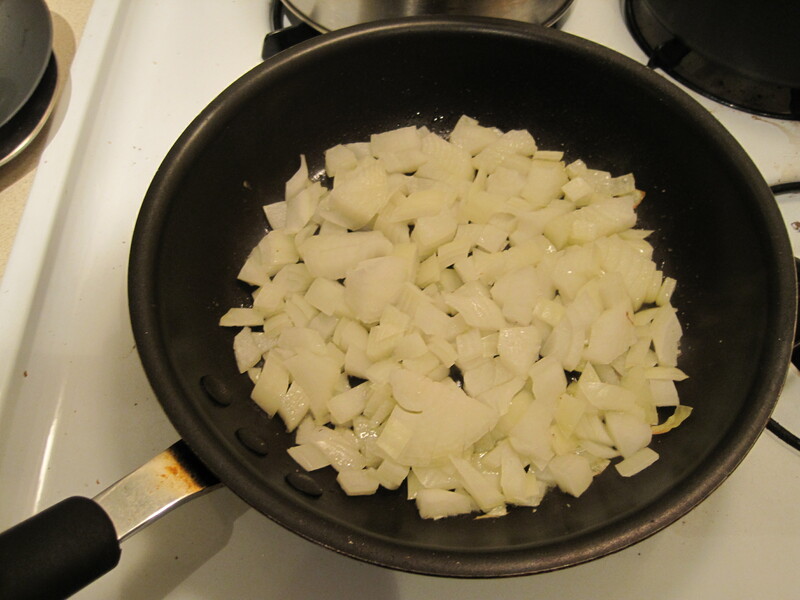 On the back burner, I sauteed a chopped onion in a little bit of olive oil. Once the onion had caramelized a little bit, I added a can of rinsed beans, chicken stock, red pepper and salt to simmer for a little bit. 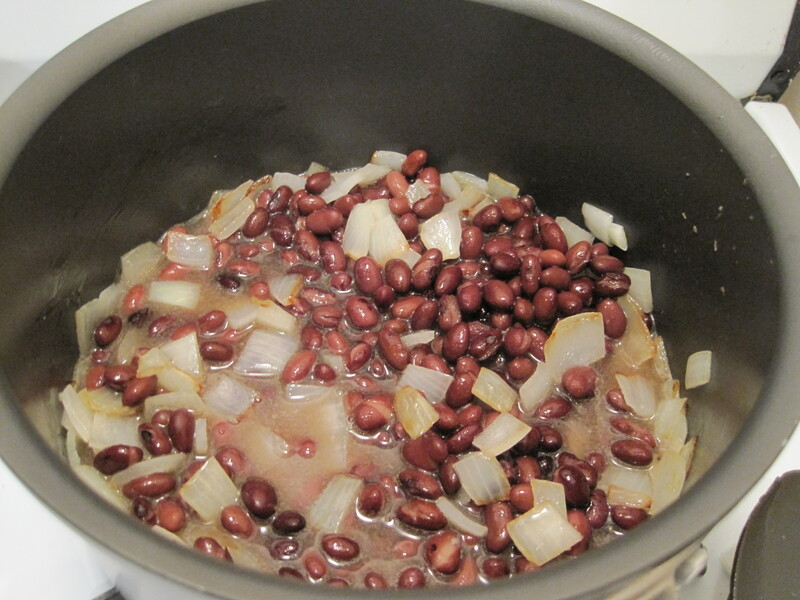 This was the start of the beans and rice that would be a side dish. 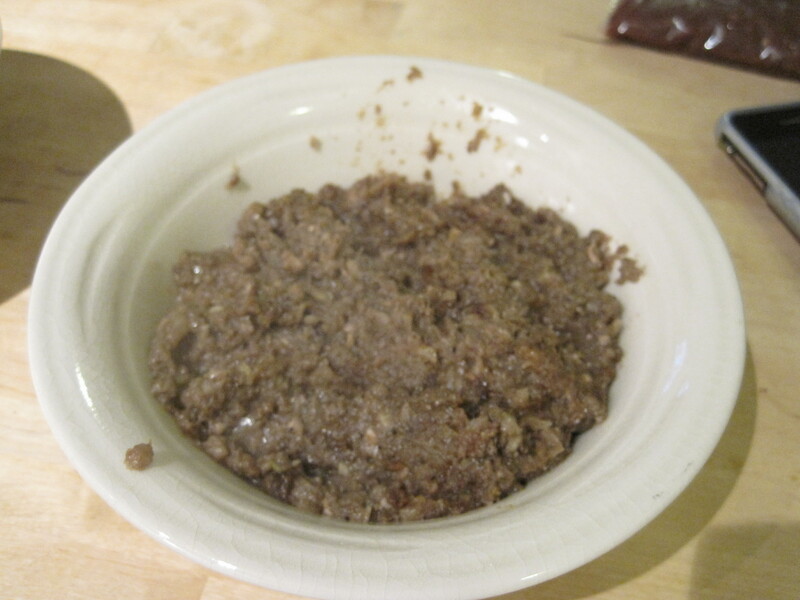 At this point the mushroom paste had cooked for a while and had a thicker consistency so it was removed and put into a bowl. Out came a pound of the fresh ground venison meat. 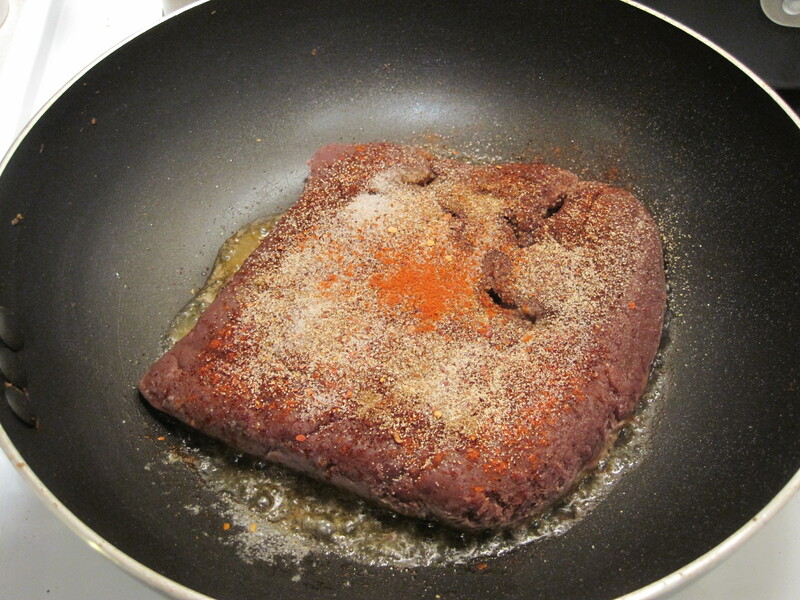 I cooked the meat with a little butter in a pan with paprika, garlic powder, cayenne, red pepper, chili powder, and salt. 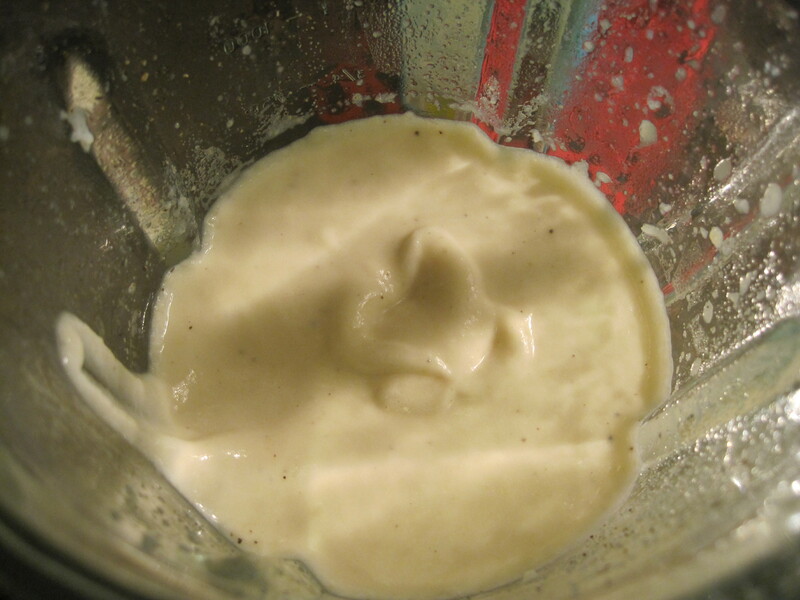 While the meat cooked, I started an aioli based on the delicious one Conor made a few weeks prior in Boston. 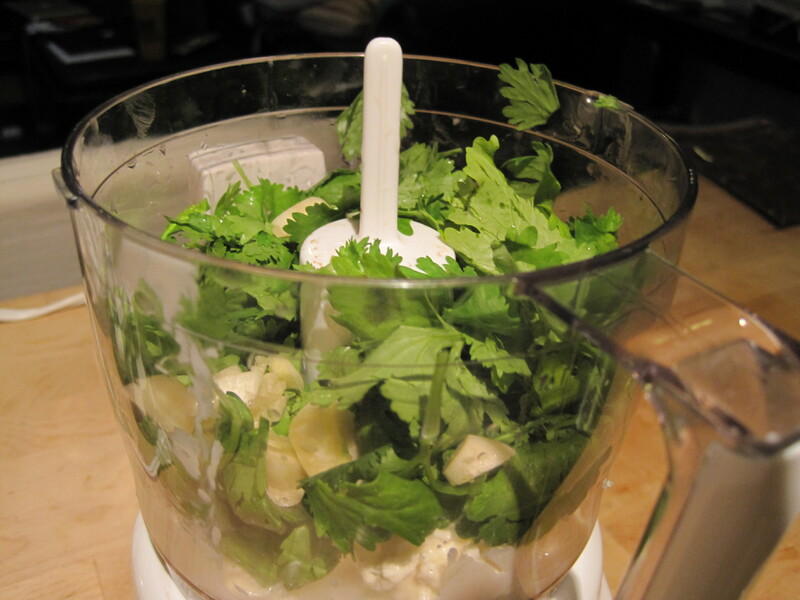 A little mayo, olive oil, lime juice, the leaves from a bundle of cilantro, three garlic cloves, and black pepper. Instead of garnishing with lettuce and tomato, which would be a little boring and not compliment the flavors well, the fresh garnish of choice was baby arugala. I don’t use arugala enough, but every time it shows up in a meal it is completely delicious. In Jamaica Plain, Kristi and my favorite meal to split is an arugala salad (dressed with lemon juice and cracked pepper) and a prosciutto pizza covered with arugala at Bela Luna. When the meat was almost fully cooked I added a splash of V-8 to give some tomato flavor to the meat since salsa wouldn’t compliment the other garnishes well. While the meat finished cooking and absorbed the V-8, a package of pre-cooked wild rice went into the bean, onion, and chicken stock mixture to simmer for a few minutes. Finally, a shot of the finished product. The finished tacos, with all of the flavors from the garnishes blending together in each bite, were truly awesome. 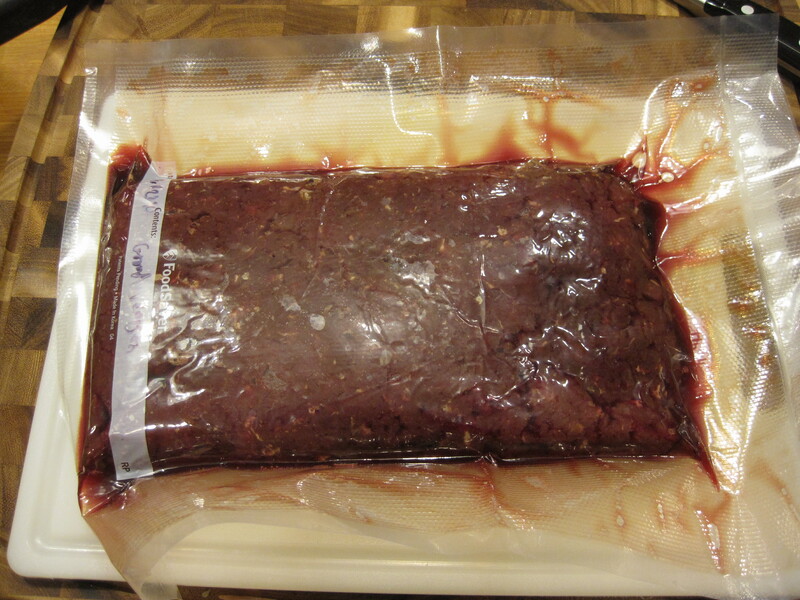 Ground venison is different from beef or turkey; not as greasy tasting as beef, not as rubbery as turkey. It has an almost grainy texture, in the best possible way, with all of the uniquely rich flavor of venison. 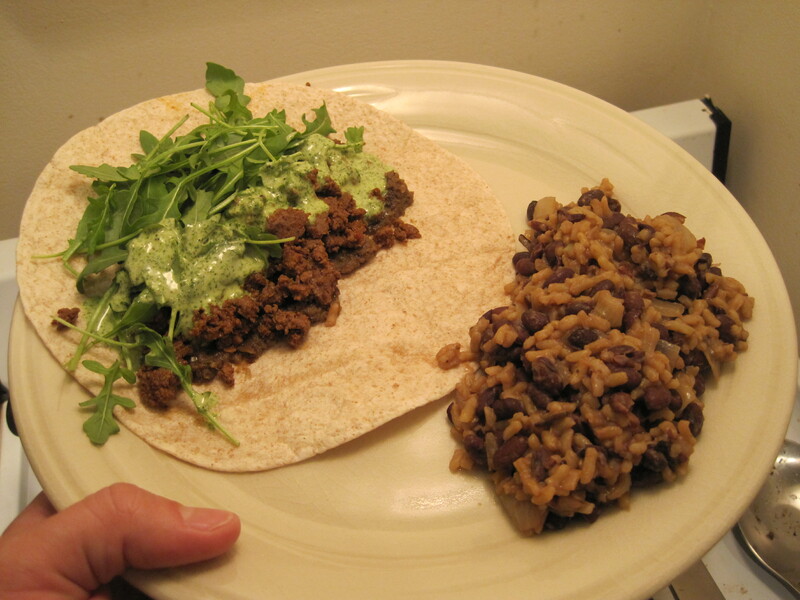 A small smear of the mushroom paste on the tortilla gave the strong and earthy mushroom flavor I was looking for. The arugala and aioli added the finishing touches of complimentary flavors, acidity, and a little fresh crunchiness. 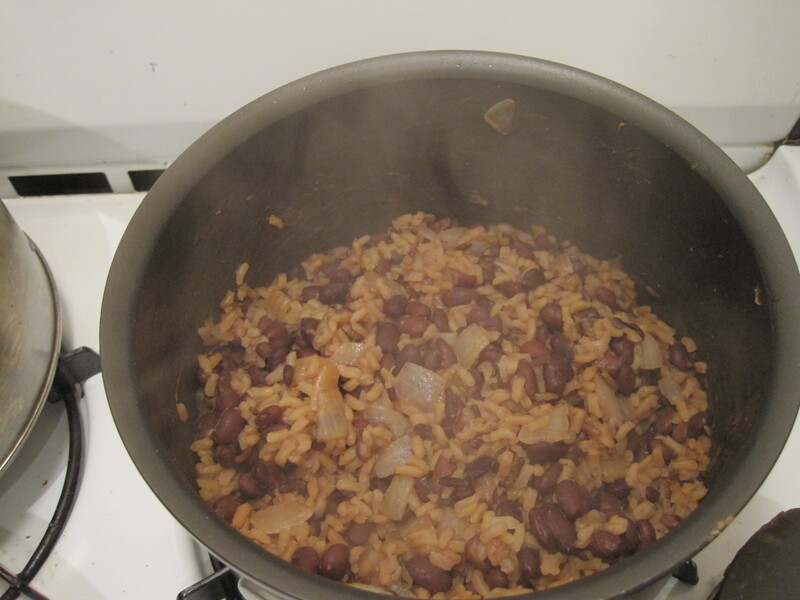 Also, when you cook beans and rice together like this, the final product is very creamy, starchy and rich. Almost like a mexican risotto. And that was it. Well, not really, I had two more tacos after the one shown and Kristi had to turn up the TV to drown out the noises I was making as I ate round two. Not sure what I’ll be making next week, might head to the Italian Market tomorrow to get something interesting to cook. Also, if you haven’t donated to my Movember mustache growing, please click here and support prostate cancer research. I’d appreciate it. Prior to meeting Kristi, I had only eaten venison a few times in my life but enjoyed it every time. Kristi’s extended family lives in Vermont and they are active hunters during deer season which has led to a lot more venison meals for me in recent years. My favorite was last year when I visited the family deer camp for a great meal, some beers, and cards. Although I was relegated to observer status, a fresh leg of venison was butchered, sauteed in butter with onions and served with potatoes. Simple and delicious. I’ve wanted to experiment with cooking venison on my own but it’s always overpriced, if you can find it, and I generally lack the man skills required to get my own through hunting. However, my brother John recently allowed an acquaintance to hunt on his property which led to a windfall of deer meat. I picked up about 10-15 pounds of a variety of cuts this past weekend and immediately started imagining new ways to use it. 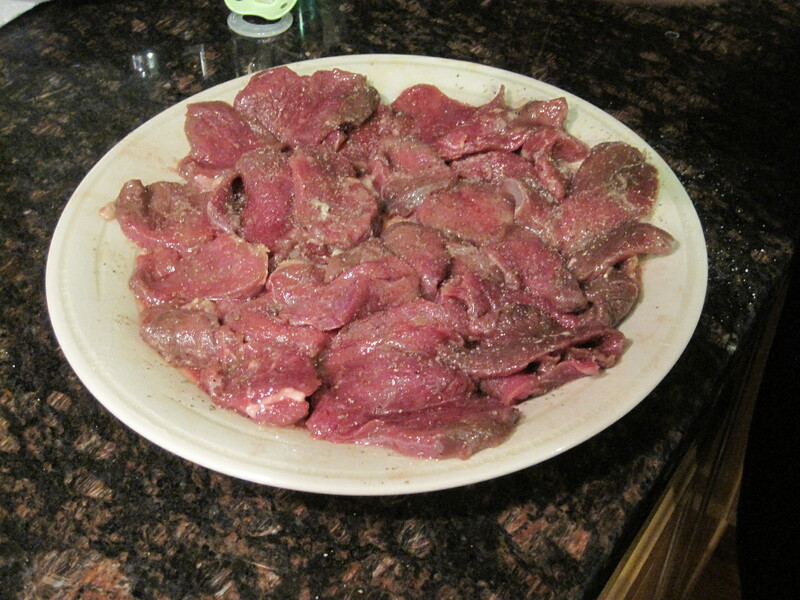 You’re likely to see a fair amount of venison dishes on this blog in the next few months. 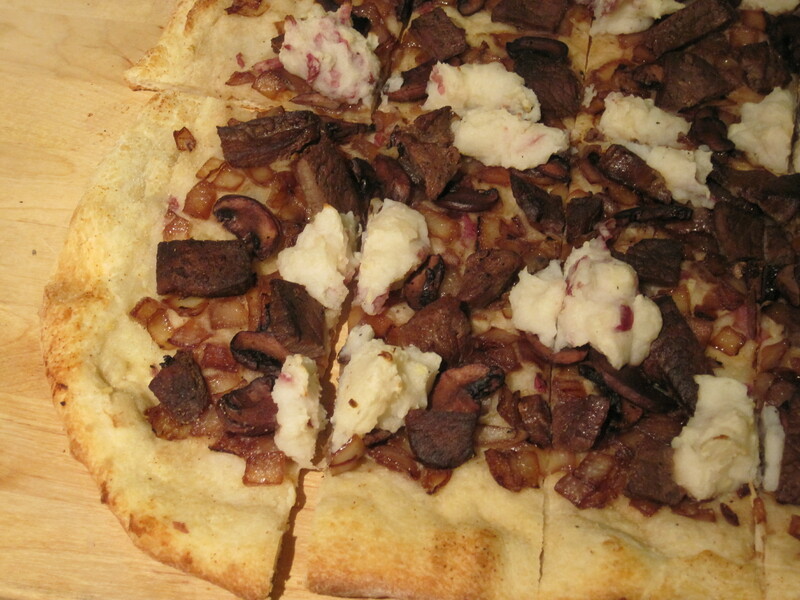 Up first, a pizza (in annoying restaurant terms, a flatbread) that would incorporate the flavors from the meal at deer camp and add a few elements. 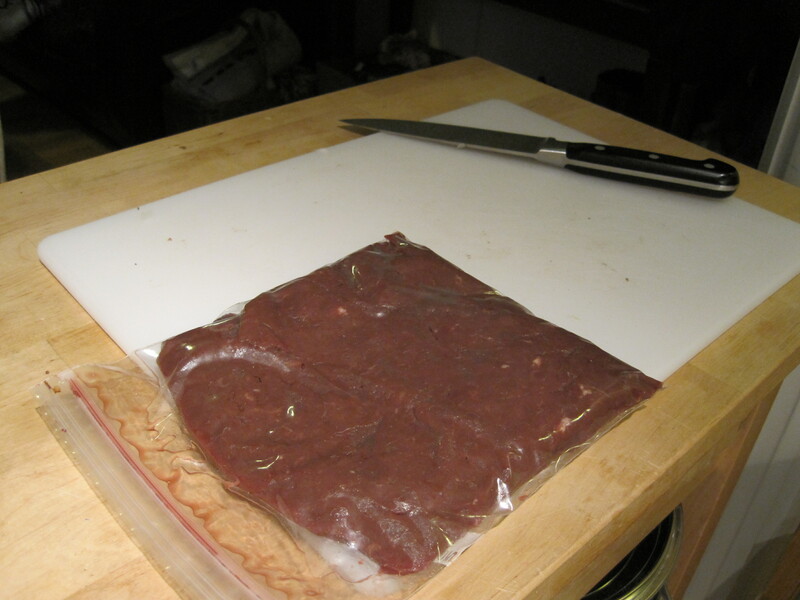 When I went to load the venison meat into the freezer, I noticed that we still hadn’t used a package of sliced leg meat that Net (Kristi’s grandmother) gave us a few months ago. Decided to use that first. 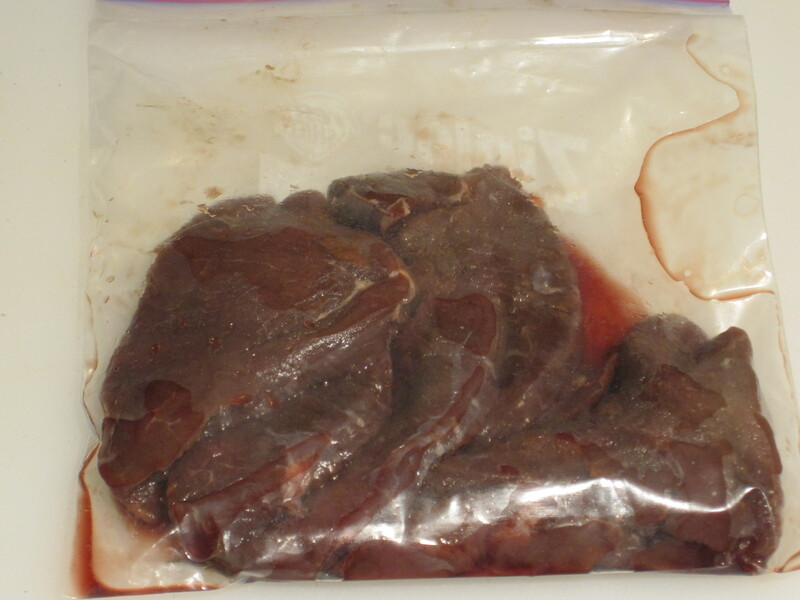 Venison is very lean and almost completely devoid of intramuscular fat. 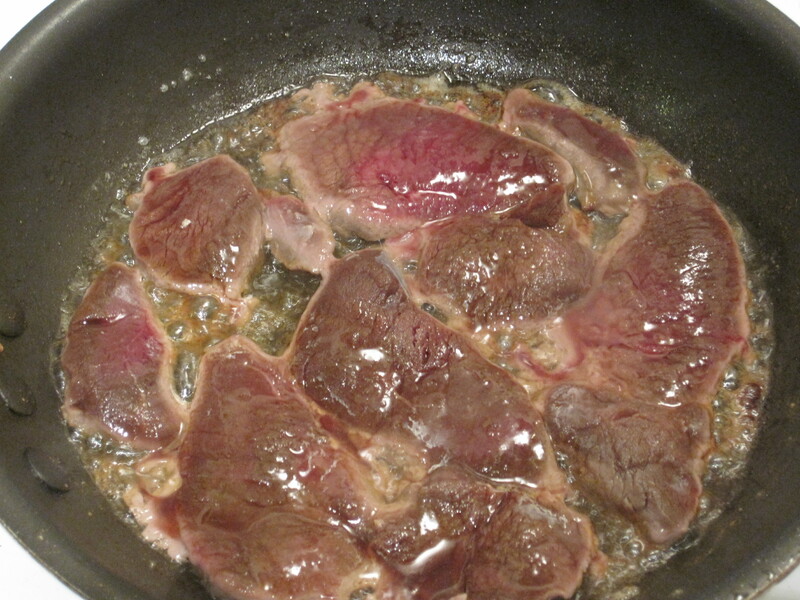 Hence the need to quickly cook in butter or oil to avoid the meat becoming too chewy. 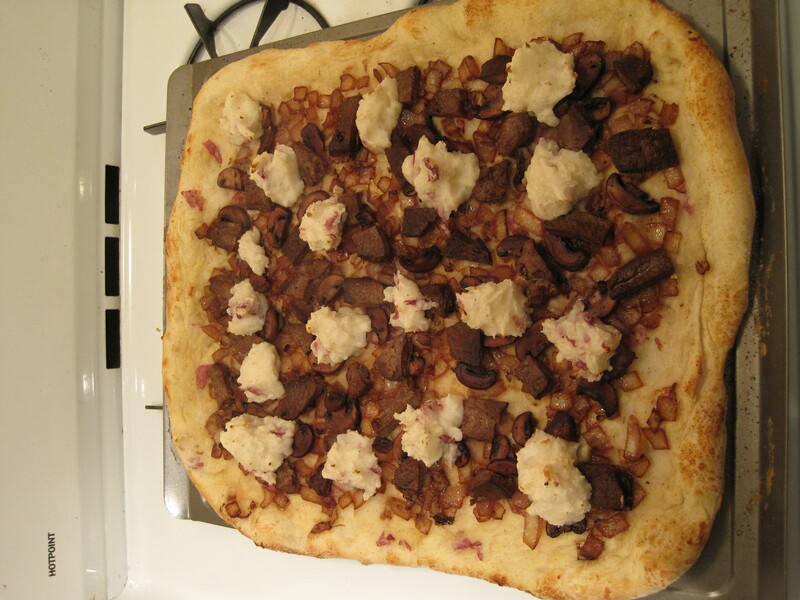 The other key ingredients for this pizza were onion, garlic, potatoes, and mushrooms. 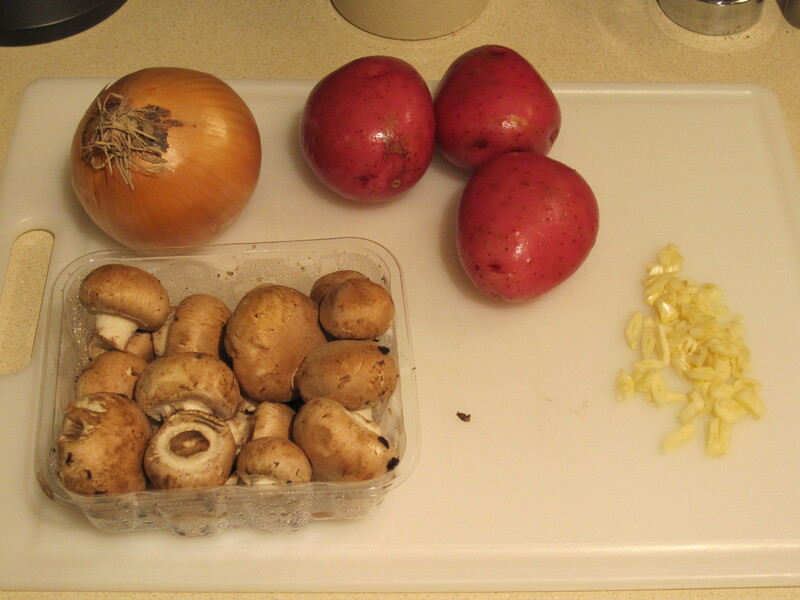 The potatoes were quartered and went into a pot of boiling water with the chopped garlic and a good amount of salt. 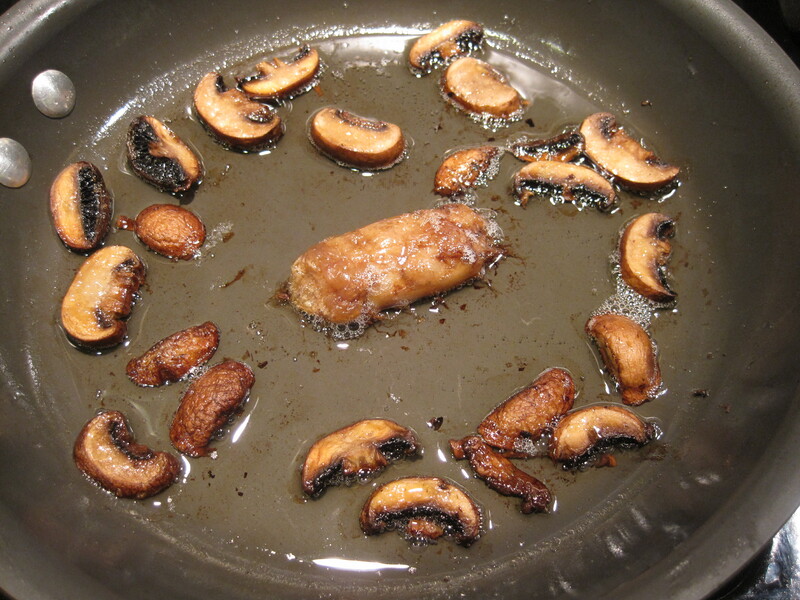 The mushrooms were also sliced, thrown into a hot pan and cooked until they browned a bit on one side. 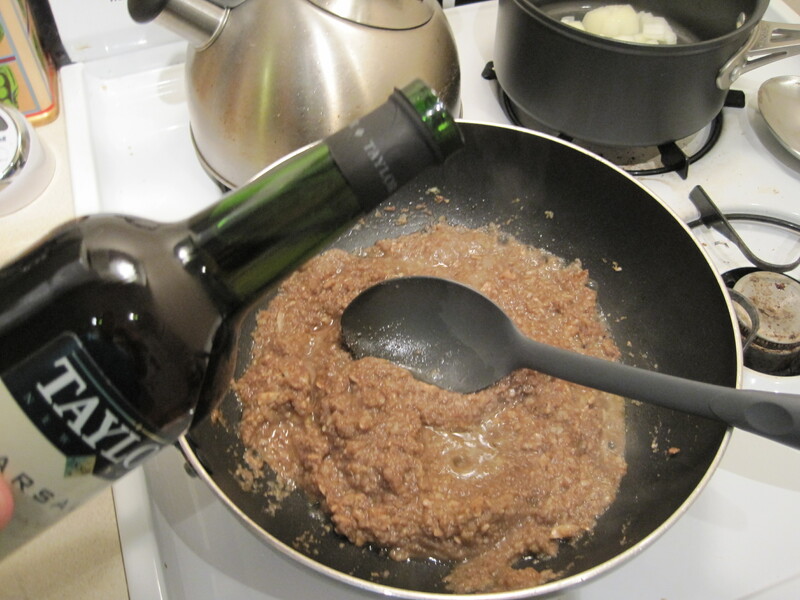 I then added a healthy pour of red wine. My thought was that the rich meaty flavor of venison would go well with some of the flavors that come from cooking with red wine. 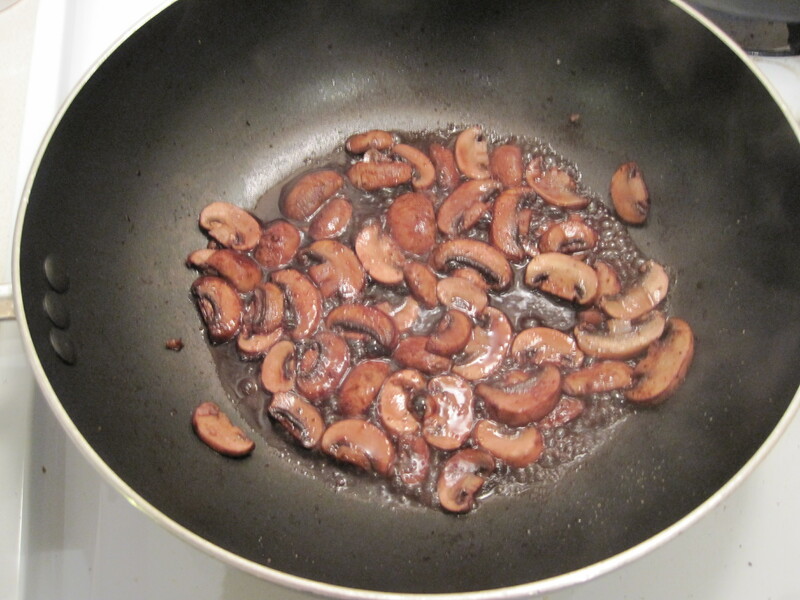 When the mushrooms were done, a fresh skillet went on the burner with some olive oil and a chopped onion. 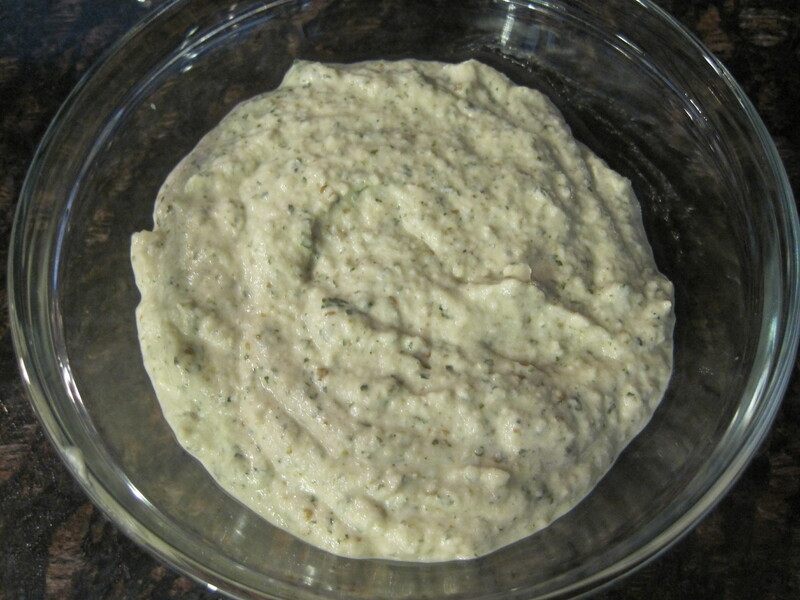 While those were cooking, the potatoes and garlic were strained and put into a bowl with milk, Brummel & Brown spread, salt and pepper to be mashed. 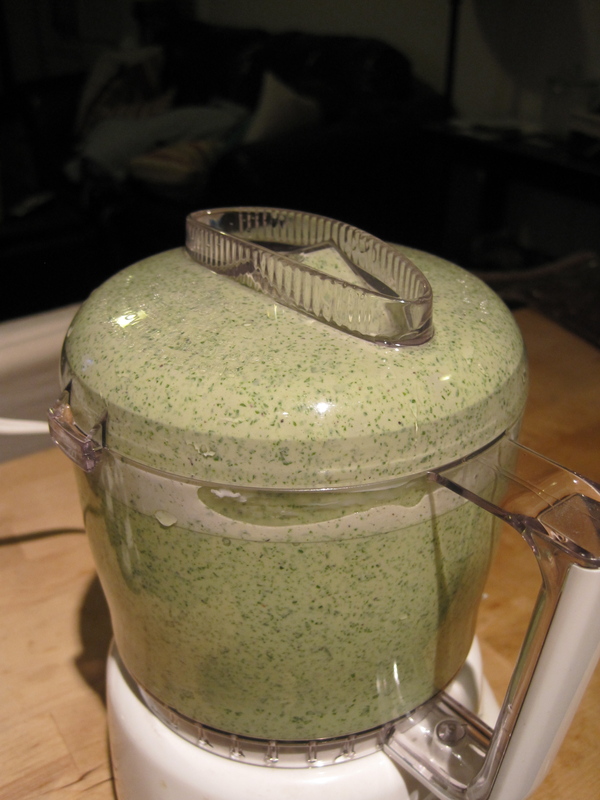 I mashed, stirred, and repeated a few times. I was looking for a very smooth and creamy texture. Once the onions had picked up a little caramelized brown color and turned translucent, I hit them with a splash of red wine as well. 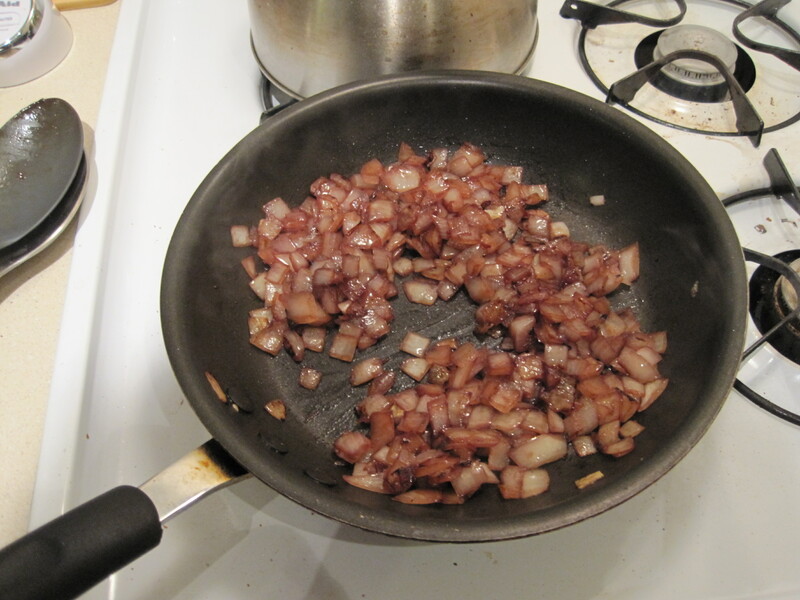 The onions were removed from the pan and a tablespoon of butter went in. This was a trick learned from deer camp; the onion juices are pulled from the pan by the butter and flavor the venison. The slices went into the hot butter for a minute or so on each side. Once cooked, I let the meat rest and sliced it into the bite sized portions you would want on a pizza. 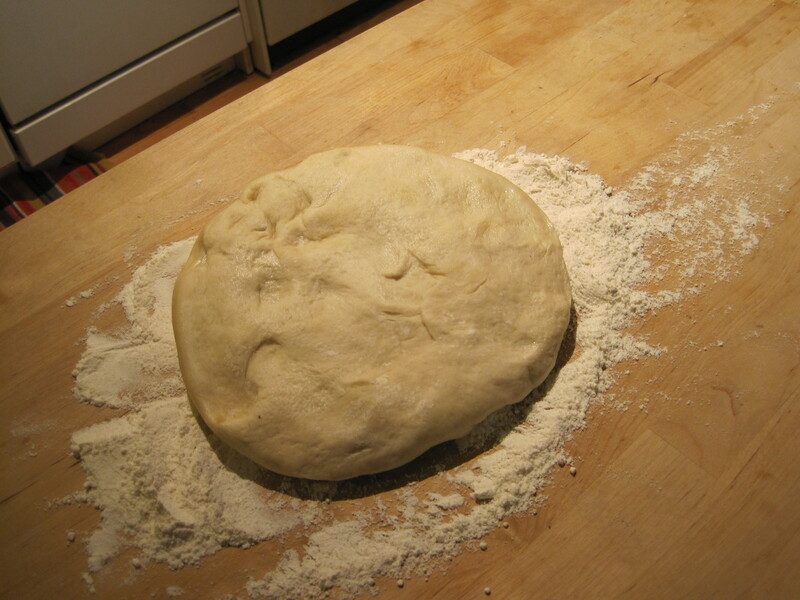 Earlier in the day, I hit up Randazzos for some raw dough. It’s a local subpar pizza shop that ruins delicious crust with awful sauce and toppings. Did the usual, stretchcd it out by hand and placed it on a greased cookie sheet. 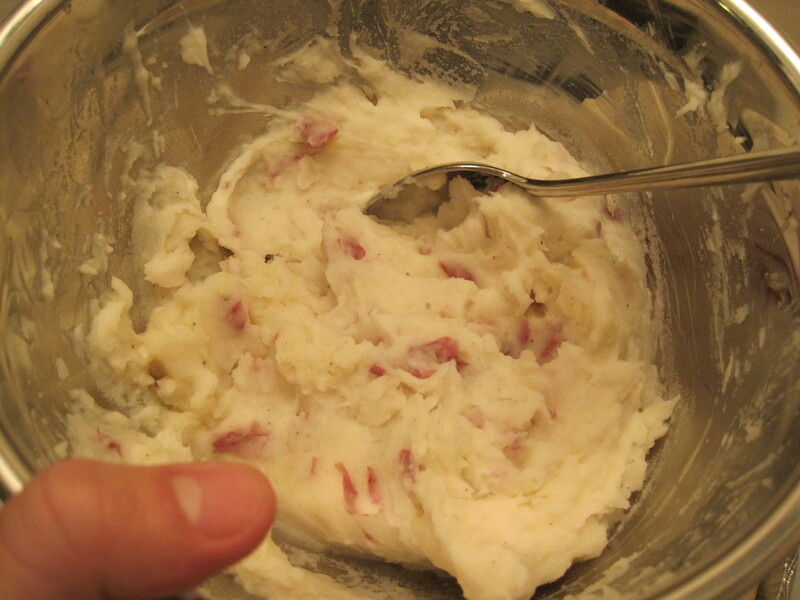 First layer to go on was a thin spreading of the mashed skin-on potatoes and garlic. I know that it doesn't sound right, but if you've ever enjoyed white pizza it should look right to you. Also, see that yellow tint I was complaining about? 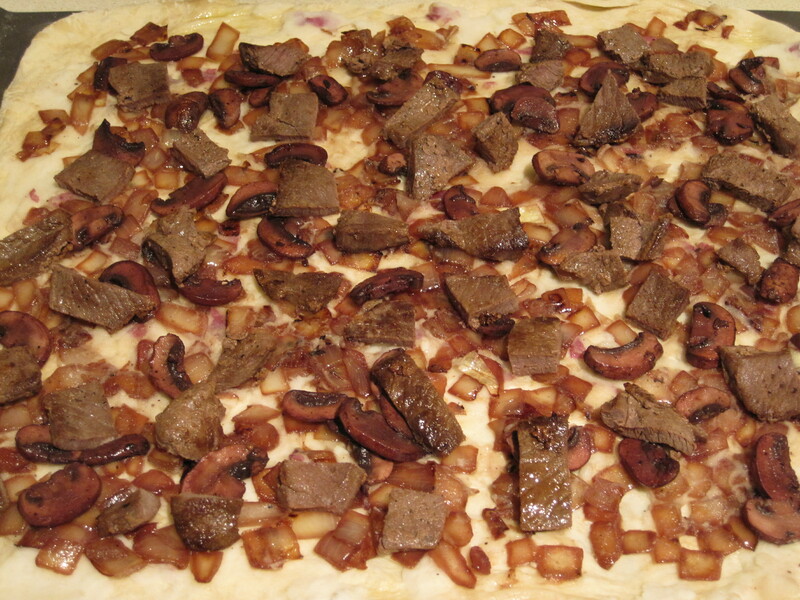 Next layer consisted of the red wine flavored onions and mushrooms as well as the venison. 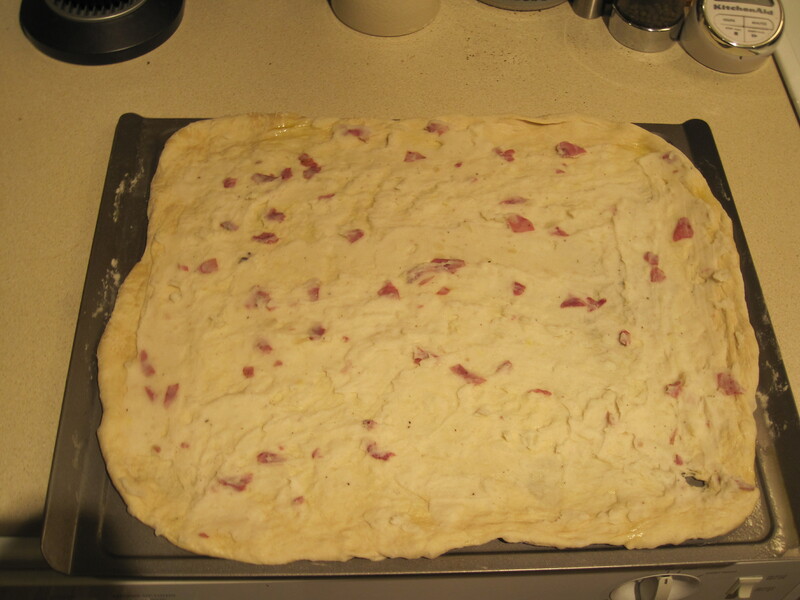 While the oven preheated to 450°, I added a bunch of dollops of mashed potato to the top of the pizza; similar to the blobs of ricotta that dot a well-made white pizza. The crust was brushed with olive oil, garlic powder, and salt, a surefire way to make the crust of any pizza delicious. 10-12 minutes later, the crust is golden brown and the tops of the potato blobs have browned a bit too. Time to come out. Slice it up and we were ready to eat. 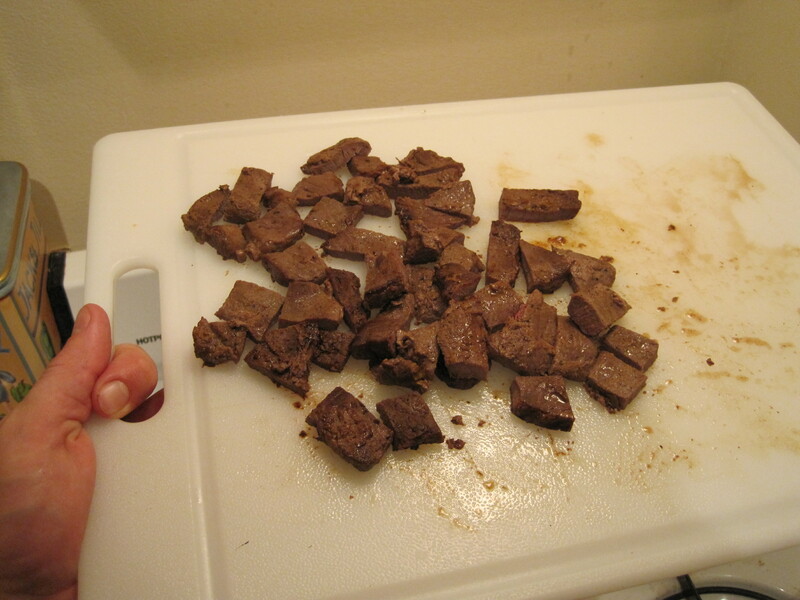 The venison was a little chewier than I would hope, too long in the freezer and cooking it twice hurt it. 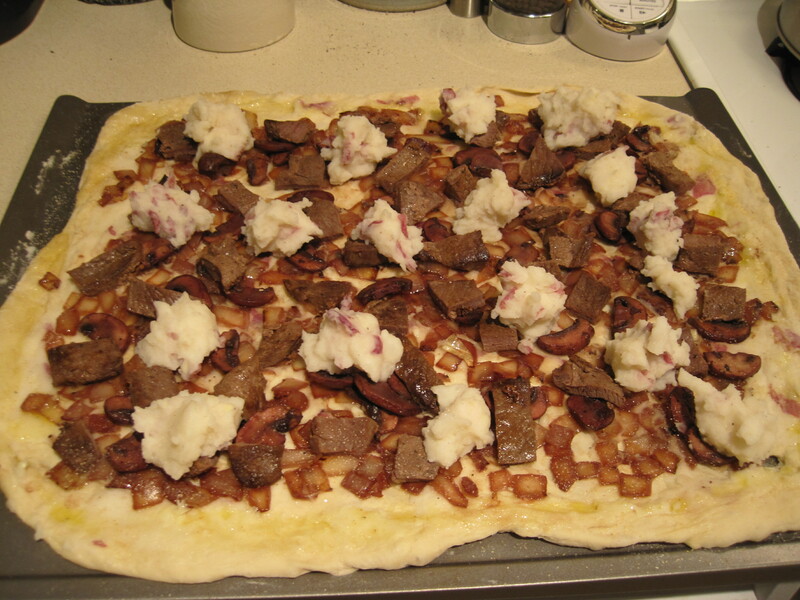 However, the flavors from the onions and mushrooms combined with slightly irony meat and creamy potatoes on a crispy crust was a very enjoyable combination. Had the rich flavors I remembered and the ones I wanted to add. Next week has a few possibilities, now I need to get back to focusing on my mustache fundraising. For those who don’t know, I am growing a mustache during the month of November as part of the Movember charity that helps raise money for prostate cancer research. A brief overview of my mustache experience can be found here and here’s the link to my donation page. Thanks again for the support!